One more key note. Even though the presentation of the chicken in this dish can be pretty stunning; it's the stuffing that makes this dish. As wonderfully juicy as the chicken is, without the stuffing, it would be quite bland. So on the day before making the chicken prepare the stuffing. There is a stuffing recipe in the book, but I prefer something like the Glutinous Rice Stuffing here. The chicken will be amazingly juicy, so all the juices soaked up in the rice is so...delici-yoso!!! Trim and soak 2 lotus leaves in hot water for 30-45 minutes(the book says twenty, but that's not enough time), unfolding and turning every 10 minutes, until leaves are saturated. Part 2 - The Chicken - here's what we worked with. Remove excess fat from the chicken and wash under cold water. Dry, then rub salt over the outside of the chicken, rinse again, and dry well. In a bowl combine marinade ingredients, and rub the exterior and interior of the chicken. Place flour on large cutting board or another surface. Make a "well" in the center of the flour. Add the hot water slowly while mixing the flour with one hand. Knead dough for 2-3 minutes, coat hand with oil to prevent sticking, and add flour to keep from sticking to kneading surface. 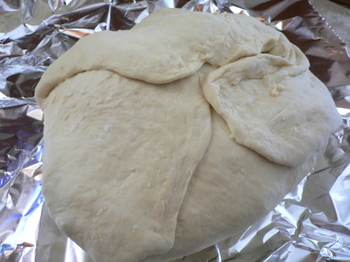 Roll out dough to a size large enough to wrap the chicken. Preheat oven to 350 degrees. Part 5 - Stuff that Bird! And close openings with skewers. Part 6 - Wrap it up. 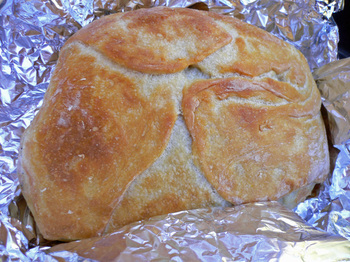 You'll need the Lotus Leaves, Flattened Dough, and 2-3 feet heavy duty Aluminum Foil. Shake Lotus leaves dry. Wrap the chicken in Lotus Leaves, make sure leaves overlap, and the edges of the leaves are on the bottom. 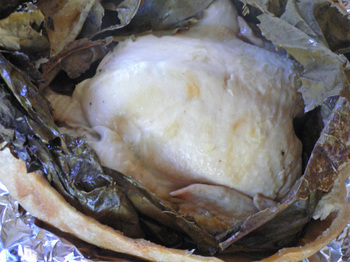 Place the Lotus Leaf wrapped chicken(breast side up) in the middle of the dough and wrap, sealing the top completely. Place dough wrapped chicken in the middle of foil and seal completely. Part 7 - Cook that Bird! At 350 degrees F, for 1 hour, then lower the temp to 325 degrees F for 3 hours. 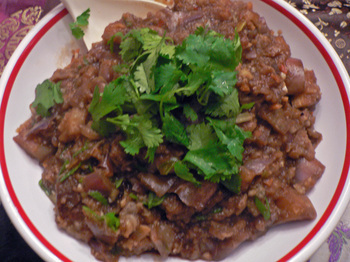 Great time to make some side dishes...maybe some Crab and Corn soup, and Spicy Stove Braised Eggplant. After the time is up(at last!!) remove chicken from the oven, and fold back the foil. You can now either cut right down the center of the dough and separate, or cut around the dough and remove the top. You'll find the chicken to be very, very tender and moist. In fact, you just stick your spoon right into the middle of the chicken, and scoop out both the chicken and stuffing. I beg you Kirk, the chicken pockets look so good; could you please give me some? Hi PE - Oh My GOD!!! You're right...all that effort, for a glorified Chicken Pocket! That is soooo funny. BTW, as promised I am cooking more, we're kind of burned out on restaurants right now. Mmmm I would like to have the drum and thigh, :-) Breakfast is serve. 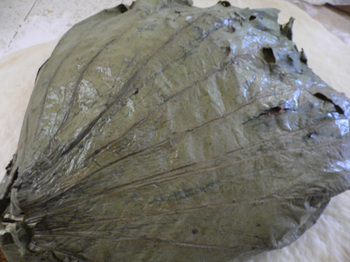 Do you know if lotus leaves themselves are edible? I cooked this dish once a long time ago, and my mom walked over and noticed the softened lotus leaves. She remarked that it smelled and looked a lot like taro leaves, which are edible. I said to her that lotus leaves probably weren't edible, but then it got me thinking: both lotus and taro leaves have the same water repelling properties, and the surface cellular structure of both leaves seem similar. Is there another reason why lotus leaves aren't considered edible? Looks great Kirk, nice job. I had beggar's chicken in HK and in place of the pastry was clay, the whole bird was incased in terra cotta and then baked. If I remember correctly this was about $80, not in a beggar's budjet. However the chicken was good. This looks sooo good. Suanne got annoyed because I asked her to make this! Can I come over for dinner? Hi CSB - According to what I read it was.....but this is a more "refined version", that they call Fu Guai Gai....still it's Beggar's Chicken at heart. Hi nhbilly - Coming right up! Hi Ed - You know, I think I've come across a recipe that used fresh lotus leaves....but I've never seen one that uses dried, albiet rehydrated leaves. Hi Steve - I had Beggar's Chicken once back home in Honolulu, you had to order it 2 days in advance, and it was sealed with clay....I really didn't think it was that great. Hi Kathy - Glad you enjoyed the post. Open a restaurant, no way, I'm not quite the cook all of you are. Hi mizducky - I'm sure it'll work, but you'll need a heck of a large piece of dough, and will have to adjust the cooking time. Let me know if you try it out. Hi Ben - Oooh, don't go getting me in trouble with Suanne, ok? Hi mizducky - Or a really large chicken!! Or maybe Beggar's Turducken anyone???? Oh Geeez CP! you crack me up....this wasn't real hard, just time consuming. I'm going right straight to Amazon to order this book...looks like fun! Hi Kirk! I've been reading your post for sometime now and I love your site! Keep up the excellent work! Being a college student still, I can't wait to try your beggars chicken recipe now that I have an actual oven to cook with. Cheers! Wow! Great post!!! I LOVE it!!! Will need to get back in the kitchen for some more homecookin! ;) Miss all my FB buddies. School's been busy, but I'm lookin forward to catching up on blogging a bit this weekend. =) Hope you and Missus are well! Hi Emily - The Chinese Kitchen is an interesting book, there are some very interesting recipes. Hi Jie - Thanks for stopping by and commenting. Hope it turns out well! Please let me know. Hi Kristy - Sounds like things are rather hectic in BoLA-land! I'm really glad to hear from you. Great post Kirk. I have the book too, but way to lazy to attempt this one! I guess I have to try it someday. Hi Jack - There are quite a few interesting recipes, though some are rather complex - I did find many of the dishes to be under seasoned, but that just may be my taste.